Not to be confused with Oregon County. Carver's map of The River of the West, 1778, showing Lake Winnipeg. Oregon was a distinctly American term for the region. The British used the term Columbia District instead. The Oregon Country consisted of the land north of 42°N latitude, south of 54°40′N latitude, and west of the Rocky Mountains—with the eastern border generally running on or close to the Continental Divide—westwards to the Pacific Ocean. The area now forms part of the present day Canadian province of British Columbia, all of the US states of Oregon, Washington, and Idaho, and parts of Montana and Wyoming. The British presence in the region was generally administered by the Hudson's Bay Company, whose Columbia Department comprised most of the Oregon Country and extended considerably north into New Caledonia and beyond 54°40′N, with operations reaching tributaries of the Yukon River. George Vancouver explored Puget Sound in 1792. Vancouver claimed it for Great Britain on 4 June 1792, naming it for one of his officers, Lieutenant Peter Puget. Alexander Mackenzie was the first European to cross North America by land north of New Spain. arriving at Bella Coola on what is now the Central Coast of British Columbia in 1793. From 1805 to 1806 Meriwether Lewis and William Clark explored the territory for the United States on the Lewis and Clark Expedition. David Thompson, working for the Montreal-based North West Company, explored much of the region beginning in 1807, with his friend and colleague Simon Fraser following the Fraser River to its mouth in 1808, attempting to ascertain whether or not it was the Columbia, as had been theorized about it in its northern reaches through New Caledonia, where it was known by its Dakleh name as the "Tacoutche Tesse". Thompson was the first European to voyage down the entire length of Columbia River. Along the way, his party camped at the junction with the Snake River on July 9, 1811. He erected a pole and a notice claiming the country for Great Britain and stating the intention of the North West Company to build a trading post on the site. Later in 1811, on the same expedition, he finished his survey of the entire Columbia, arriving at a partially constructed Fort Astoria two months after the departure of John Jacob Astor's ill-fated Tonquin. The earliest evidence of the name Oregon has Spanish origins. The term "orejón" comes from the historical chronicle Relación de la Alta y Baja California (1598) written by the new Spaniard Rodrigo Motezuma and made reference to the Columbia river when the Spanish explorers penetrated into the actual North American territory that became part of the Viceroyalty of New Spain. This chronicle is the first topographical and linguistic source with respect to the place name Oregon. There are also two other sources with Spanish origins such as the name Oregano which grows in the southern part of the region. It is most probable that the American territory was named by the Spaniards as there are some populations in Spain such as "Arroyo del Oregón" which is situated in the province of Ciudad Real, also considering that the individualization in Spanish language "El Orejón" with the mutation of the letter "g" instead of "j". Another subsequent theory is that French Canadian fur company employees called the Columbia River "hurricane river" le fleuve d'ouragan, because of the strong winds of the Columbia Gorge. George R. Stewart argued in a 1944 article in American Speech that the name came from an engraver's error in a French map published in the early 18th century, on which the Ouisiconsink (Wisconsin River) was spelled "Ouaricon-sint", broken on two lines with the -sint below, so that there appeared to be a river flowing to the west named "Ouaricon". This theory was endorsed in Oregon Geographic Names as "the most plausible explanation". Spanish territorial claims in the West Coast of North America, 18th century. The Oregon Country was originally claimed by Great Britain, France, Russia, and Spain; the Spanish claim was later taken up by the United States. The extent of the region being claimed was vague at first, evolving over decades into the specific borders specified in the US-British treaty of 1818. 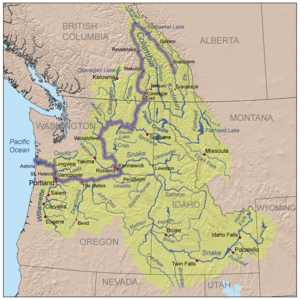 The U.S.-based its claim in part on Robert Gray's entry of the Columbia River in 1792 and the Lewis and Clark Expedition. Great Britain based its claim in part on British overland explorations of the Columbia River by David Thompson and on prior discovery and exploration along the Coast. Spain's claim was based on the Inter caetera and Treaty of Tordesillas of 1493–94, as well as explorations of the Pacific coast in the late 18th century. Russia based its claim off its explorations and trading activities in the region and asserted its ownership of the region north of the 51st parallel by the Ukase of 1821, which was quickly challenged by the other powers and withdrawn to 54°40′N by separate treaties with the US and Britain in 1824 and 1825 respectively. Spain gave up its claims of exclusivity via the Nootka Conventions of the 1790s. 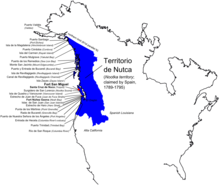 In the Nootka Conventions, which followed the Nootka Crisis, Spain granted Britain rights to the Pacific Northwest, although it did not establish a northern boundary for Spanish California, nor did it extinguish Spanish rights to the Pacific Northwest. Spain later relinquished any remaining claims to territory north of the 42nd parallel to the United States as part of the Adams-Onís Treaty of 1819. In the 1820s, Russia gave up its claims south of 54°40′ and east of the 141st meridian in separate treaties with the United States and Britain. In 1821, as part of the forced merger between the North West Company and the Hudson's Bay Company, the British Parliament imposed the laws of Upper Canada on British subjects in Rupert's Land and Columbia District, and gave the authority to enforce those laws to the Hudson's Bay Company. Chief Factor John McLoughlin, as HBC's manager in the Columbia District, applied the law to British subjects and sought to maintain law and order over American settlers, as well. In 1843 settlers established their own government, called the Provisional Government of Oregon. A legislative committee drafted a code of laws known as the Organic Law. It included the creation of an executive committee of three, a judiciary, militia, land laws, and four counties. There was vagueness and confusion over the nature of the 1843 Organic Law, in particular whether it was constitutional or statutory. In 1844, a new legislative committee decided to consider it statutory. The 1845 Organic Law made additional changes, including allowing the participation of British subjects in the government. Although the Oregon Treaty of 1846 settled the boundaries of US jurisdiction, the Provisional Government continued to function until 1849, when the first governor of Oregon Territory arrived. A faction of Oregon politicians hoped to continue Oregon's political evolution into an independent nation, but the pressure to join the United States would prevail by 1848, four months after the Mexican–American War. David Thompson navigated the entire length of Columbia River in 1811. Map of Columbia and its tributaries showing modern political boundaries. In 1805, the American Lewis and Clark expedition marked the first official American exploration of the area, then creating the first temporary settlement of Euro-Americans in the area near the mouth of the Columbia River at Fort Clatsop. Two years later in 1807, David Thompson of the British-owned North West Company (later the Hudson's Bay Company) penetrated the Oregon Country from the north, via Athabasca Pass, near the headwaters of the Columbia River. From there he navigated nearly the full length of the river through to the Pacific Ocean. 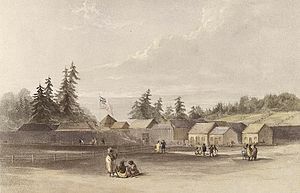 In 1810, John Jacob Astor commissioned and began the construction of the American Pacific Fur Company fur-trading post at Fort Astoria just five miles from the site of Lewis and Clark's former Fort Clatsop, completing construction of the first permanent Euro-American settlement in the area in 1811. This settlement later served as the nucleus of present day Astoria, Oregon. During the period of the construction of Fort Astoria, Thompson traveled down the Columbia River, then noting the partially constructed American Fort Astoria only two months after the departure of the supply ship Tonquin. Along the way, Thompson had set foot on and claimed for the British Crown, the lands in the vicinity of the future Fort Nez Perces site at the confluence of the Columbia and Snake rivers. This claim initiated a very brief era of competition between American and British fur traders. During the War of 1812 Fort Astoria was captured by the British and sold to the North West Company. Under British control, Fort Astoria was renamed Fort George. In 1821 when the North West Company was merged with the Hudson's Bay Company, the British Parliament moved to impose the laws of Upper Canada upon British subjects in Columbia District and Rupert's Land, and issued the authority to enforce those laws to the Hudson's Bay Company. Chief Factor John McLoughlin was appointed manager of the district's operations in 1824. He moved the regional Company headquarters to Fort Vancouver (modern Vancouver, Washington) in 1824. Fort Vancouver became the centre of a thriving colony of mixed origin, including Scottish Canadians and Scots, English, French Canadians, Hawaiians, Algonkians, and Iroquois, as well as the offspring of company employees who had intermarried with various local native populations. McLoughlin applied the laws to British subjects, kept the peace with the natives and maintained friendly relations with American merchants and later colonists. Astor continued to compete for Oregon Country furs through his American Fur Company operations in the Rockies. In the 1820s, a few American explorers and traders visited this land beyond the Rocky Mountains. Long after the Lewis and Clark Expedition and also after the consolidation of the fur trade in the region by the Canadian fur companies, American "Mountain Men" such as Jedediah Smith and Jim Beckwourth came roaming into and across the Rocky Mountains, following Indian trails through the Rockies to California and Oregon. They sought beaver pelts and other furs, which were obtained by trapping. These were difficult to obtain in the Oregon Country due to the Hudson's Bay Company policy of creating a "fur desert": deliberate over-hunting of the area's frontiers, so that American trades would find nothing there. The Mountain Men, like the Metis employees of the Canadian fur companies, adopted Indian ways and many of them married Native American women. American settlers began to arrive from the east by the Oregon Trail starting in the early 1840s, and came in increasing numbers each subsequent year. Increased tension led to the Oregon boundary dispute. Both sides realized that settlers would ultimately decide who controlled the region. The Hudson's Bay Company, which had previously discouraged settlement as it conflicted with the lucrative fur trade, belatedly reversed their position. In 1841, on orders from Sir George Simpson, James Sinclair guided more than 100 settlers from the Red River Colony to settle on HBC farms near Fort Vancouver. The Sinclair expedition crossed the Rockies into the Columbia Valley, near present-day Radium Hot Springs, British Columbia, then traveled south-west down the Kootenai River and Columbia River following the southern portion of the well established York Factory Express trade route. The Canadian effort proved to be too little, too late. In what was dubbed "The Great Migration of 1843" or the "Wagon Train of 1843", an estimated 700 to 1,000 American emigrants came to Oregon, decisively tipping the balance. Britain gave up claims to its portion of the Columbia District south of the 49 parallel to the United States by the Oregon Treaty in 1846. In 1843 the Hudson's Bay Company—HBC shifted its Columbia Department headquarters from Fort Vancouver to Fort Victoria on Vancouver Island. The plan to move to more northern locations dated back to the 1820s. George Simpson was the main force behind the move north; John McLoughlin became the main hindrance. McLoughlin had devoted his life's work to the Columbia business and his personal interests were increasingly linked to the growing settlements in the Willamette Valley. He fought Simpson's proposals to move north, but in vain. By the time Simpson made the final decision in 1842 to move the headquarters to Vancouver Island, he had had many reasons for doing so. There was a dramatic decline in the fur trade across North America. In contrast the HBC was seeing increasing profits with coastal exports of salmon and lumber to Pacific markets such as Hawaii. Coal deposits on Vancouver Island had been discovered and steamships such as the Beaver had shown the growing value of coal, economically and strategically. A general HBC shift toward Pacific shipping and away from the interior of the continent made Victoria Harbour much more suitable than Fort Vancouver's location on the Columbia River. The Columbia Bar at the river's mouth was dangerous and routinely meant weeks or months of waiting for ships to cross. The largest ships could not enter the river at all. Finally, the growing numbers of American settlers along the lower Columbia gave Simpson reason to question the long term security of Fort Vancouver. He worried, rightfully so, that the final border resolution would not follow the Columbia River. By 1842 he thought it more likely that the US would at least demand Puget Sound, and the British government would accept a border as far north as the 49th parallel, excluding Vancouver Island. Despite McLoughlin's stalling, the HBC had begun the process of shifting away from Fort Vancouver and toward Vancouver Island and the northern coast in the 1830s. The increasing number of American settlers arriving in the Willamette Valley after 1840 served to make the need more pressing. In 1848, the U.S. portion of the Oregon Country was formally organized as the Oregon Territory. In 1849, Vancouver Island became a British Crown colony—the Colony of Vancouver Island, with the mainland being organized into the Colony of British Columbia in 1858. Shortly after the establishment of Oregon Territory there was an effort to split off the region north of the Columbia River, which resulted in the creation of Washington Territory in 1853. The banks of the river throughout are low and skirted in the distance by a chain of moderately high lands on each side, interspersed here and there with clumps of wide spreading oaks, groves of pine, and a variety of other kinds of woods. Between these high lands lie what is called the valley of the Wallamitte [sic], the frequented haunts of innumerable herds of elk and deer ... In ascending the river the surrounding country is most delightful, and the first barrier to be meet with is about forty miles up from its mouth. Here the navigation is interrupted by a ledge of rocks, running across the river from side to side in the form of an irregular horseshoe, over which the whole body of water falls at one leap down a precipice of about forty feet, called the Falls. [Oregonians] were all honest, because there was nothing to steal; they were all sober, because there was no liquor to drink; there were no misers, because there was no money to hoard; and they were all industrious, because it was work or starve. ^ Meinig, D.W. (1995) . The Great Columbia Plain (Weyerhaeuser Environmental Classic ed.). University of Washington Press. p. 104. ISBN 0-295-97485-0. ^ Mackie, Richard Somerset (1997). Trading Beyond the Mountains: The British Fur Trade on the Pacific 1793-1843. Vancouver: University of British Columbia (UBC) Press. p. 284. ISBN 0-7748-0613-3. ^ Motezuma, Rodrigo (2002). La isla de oro: relación de la alta y Baja California (1. ed.). Valladolid: Universitas Castellae. ISBN 84-92315-67-9. ^ Fernández-Shaw, Carlos M. (1987). Presencia española en los Estados Unidos (2a ed. aum. y corr. ed.). Madrid: Instituto de Cooperación Iberoamericana, Ediciones Cultura Hispánica. ISBN 84-7232-412-5. ^ Stewart, George R. (1944). "The Source of the Name 'Oregon'". American Speech. Duke University Press. 19 (2): 115–117. doi:10.2307/487012. JSTOR 487012. ^ Meinig, D.W. (1995) . The Great Columbia Plain (Weyerhaeuser Environmental Classic ed.). University of Washington Press. p. 52. ISBN 0-295-97485-0. ^ Mackie, Richard Somerset (1997). Trading Beyond the Mountains: The British Fur Trade on the Pacific 1793-1843. Vancouver: University of British Columbia (UBC) Press. pp. 65, 108, 110–111. ISBN 0-7748-0613-3. ^ Mackie, Richard Somerset (1997). Trading Beyond the Mountains: The British Fur Trade on the Pacific 1793-1843. Vancouver: University of British Columbia (UBC) Press. pp. 64–65, 259. ISBN 0-7748-0613-3. ^ The Wagon Train of 1843: The Great Migration. Oregon Pioneers. Retrieved on 2007-12-22 from "Archived copy". Archived from the original on 2008-05-31. Retrieved 2016-02-06. CS1 maint: Archived copy as title (link). ^ The West Film Project (2001). Events in The West: 1840-1850. PBS, 2001. Retrieved on 2007-12-22 from https://www.pbs.org/weta/thewest/events/1840_1850.htm. ^ MacColl, E. Kimbark (1979). The Growth of a City: Power and Politics in Portland, Oregon 1915-1950. Portland, Oregon: The Georgian Press. ISBN 0-9603408-1-5. Wikimedia Commons has media related to Oregon Country.